The struggling tech company is being taken private for a hefty premium. Shares of Infoblox (NYSE:BLOX), a provider of network control services, soared on Monday following news that the company had agreed to be acquired. At 11:45 a.m. EDT, the stock was up 15%. Private equity firm Vista Equity Partners will pay $26.50 per share in cash for Infoblox, representing a 73% premium to the stock price on May 11, when the first reports of a potential buyout surfaced. Under this deal, the company is valued at $1.6 billion, about 4.5 times fiscal year 2016 sales. This buyout comes at a time when Infoblox is struggling. After fairly rapid revenue growth over the past few years, growth has ground to a halt, with sales declining slightly during the company's latest quarter. The company announced that it was laying off about 12% of its workforce in June, a step that generally doesn't mean a return to rapid growth is on the way. "This transaction will provide immediate and substantial value to Infoblox stockholders, while also giving Infoblox greater flexibility to execute on our long-term strategy to drive increased DDI automation and DNS security into the enterprise market," said Infoblox CEO Jesper Andersen. "We are excited to begin our partnership with Vista and look forward to leveraging their operational insights as we continue to deliver the industry-leading products, solutions, and customer service on which our customers rely." 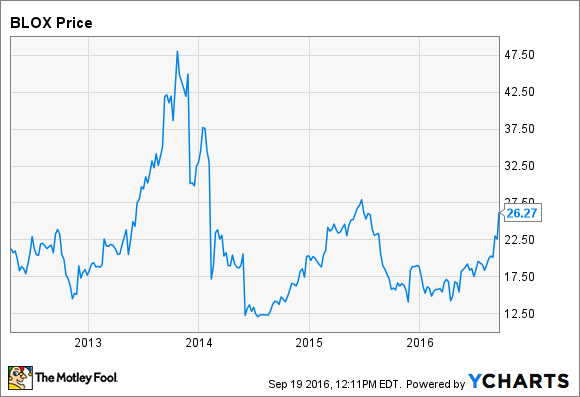 The acquisition of Infoblox comes at a price well below the stock's all-time high of about $47 per share reached in late 2013. Investor enthusiasm following Infoblox's IPO quickly fizzled, sending the stock tumbling over the following six months. The company expects the transaction to close during the second fiscal quarter. Infoblox recommends that its shareholders tender their shares.